Like all legal issues, certain forms are needed in a Florida child custody case. Whether both parents are married and getting a divorce or unmarried and living apart, child custody issues need to be resolved. The only vehicle for solving issues surrounding child custody is a court hearing. In a Florida court custody hearing, the court will determine all custody and support issues dealing with children. The best method for anyone seeking a court ruling is to fill out all of the necessary forms as accurately and completely as possible and work out as many of the details as possible before attending a court hearing. Many child custody forms are relatively complicated and require some understanding of legal forms to be completed. While it is recommended that anyone seeking a child custody ruling consult with an attorney, it is not required. Many websites list all of the forms necessary for any Florida family law case. In fact, the Florida Supreme Court has created and published a variety of official forms, along with instructions on how to fill out each form, in order to help people understand and use correct family law forms. A variety of situations exist surrounding child custody issues. One of the primary reasons for a child custody case is due to divorce. A divorce, or dissolution of marriage, requires multiple family law forms in order to be processed. In the beginning of a divorce involving child custody issues, a Form 12.901 (b)(1), Petition For Dissolution Of Marriage With Dependent Or Minor Children, needs to be completed and filed with the clerk of the circuit court. This petition outlines any requests regarding children and refers the court to attached documents for child custody rulings. In addition to the petition, a Parenting Plan, Form 12.995(a) must be submitted. In any divorce, both parents will agree upon a Parenting Plan or the court will establish one in the best interest of the child. A Parenting Plan outlines the custody agreement for the children and sets up visitation, cohabitation, and child support. At a minimum the Parenting Plan must include information covering how the parties will time-share the child, how the parties will share the responsibility for the daily tasks associated with raising a child. Also, a listing of who will be responsible for health care, school matters, and other activities the child or children will be involved in, and how each parent will communicate with their children. Another situation that arises outside of the scope of divorce is separations. Many couples will separate without filing for dissolution of marriage. This separation can leave the parent caring for children in a financial bind. For this reason, a Petition For Support Unconnected With Dissolution of Marriage With Dependent Or Minor Child(ren), Form 12.904(a), was created. The purpose of this petition and its supporting documents is to ask the court to order child support and spousal support while the separation is in effect. In a situation where a mother is seeking to establish paternity, Family Law Form 12.983(a) is used. This form, Petition To Determine Paternity And For Related Relief, will establish paternity, a time-sharing schedule, and/or child support of a single child or multiple children. Along with this form, a Financial Affidavit, a Uniform Child Custody Jurisdiction and Enforcement Act Affidavit (UCCJEA), a Child Support Guidelines Worksheet, and Parenting Plan must be filed. The Family Law Financial Affidavit, Form 12.902(b) or (c), establishes the overall income of both parties involved in the Florida Child Custody case. The UCCJEA Affidavit, Form 12.902(d), is required in any child custody case, whether both parents agree on the disposition of the child or not. This form lists background information on all children involved in the case and a historical (5-year) record on where the child or children lived. The Child Support Guidelines Worksheet, Form 12.902(e), lists all income for both parties and helps to establish an overall cost of children along with how much support they will need. Finally, the Parenting is explained above, and is required in all Florida child custody cases. If the father contests the initial petition to determine paternity then the court can order a scientific paternity test to be performed in order to match a father’s DNA to a child’s DNA. This will result in a final paternity judgment. The forms listed above are not a comprehensive list of all forms needed in every Florida child custody case. The good news for anyone filling out the forms is that the petitions contain a list of all necessary Florida legal forms to complete and submit to the clerk of the circuit court. In addition to what is listed on the petition, it would be in anyone’s best interest to contact the clerk’s office to determine if there are any additional local forms necessary for the child custody case. The Self Help Guides' Modifying Child Custody & Visitation in Florida helps you navigate the court process and procedures once you file your documents with easy to follow checklists, links to websites, important addresses & phone numbers, and much more. 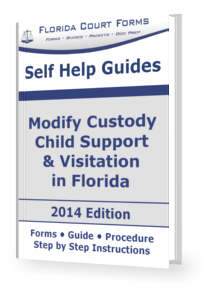 The Self Help Guide - Modifying Custody & Visitation - is designed to easily file the Supplemental Petition to Modify Custody & Visitation with all the required and supporting forms. The Self Help Guide includes easy to follow step by step instructions, all the required & supporting forms, filing procedures & checklists, complete guide to the Parenting Plans, easy to understand and written in plain English. Order the e-book instant download or use our Petition Preparer professional documents preparation service. Your documents will be in your hands and ready to file at the courthouse in 3 days or less! We guarantee our work.